If there is one room in a house that Indian families are most attached to, it is the kitchen. The shape, direction, furniture, look everything is taken into consideration before finalizing the kitchen. People say, the taste of the food prepared in a kitchen comes from how comfortable the cook feels inside the kitchen. So, if you want fabulous food, you better take the kitchen seriously. Depending on the space available, a kitchen is generally constructed in ‘L’ shape, ‘U’ shape, rectangular or one wall kitchen. The rectangular or ‘U’ shaped design requires more space than a ‘L’ shaped kitchen. Lighting not only adds warmth to a room, it also lends a distinct character to the space. 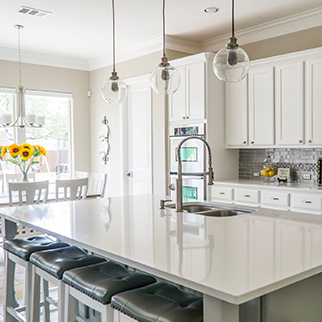 Whether you want natural light to flood your kitchen or strategically placed soft yellow lights, it is completely your choice. You can also fit lights inside your kitchen cabinets and cover them with glass doors. It will enhance the look of the kitchen and make it appear bigger. If you want your kitchen to look and bright and airy, always opt for softer colours. But on the downside, they can be a little difficult to maintain. Apart from the looks, decide the colours of your kitchen based on the flooring, countertop and furniture colour. 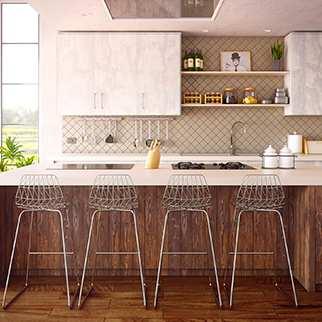 Neutral colours look best with wooden furniture whereas bright coloured walls complement modern kitchens beautifully. 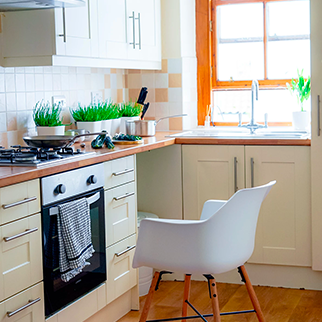 In any urban kitchen, lack of space is a common issue. So, interior designers need to ensure optimum use of space with multiple shelves and drawers. A stack of drawers with varied storage areas is the perfect solution to this problem. They will not only keep your kitchen organized and neat, the countertops will also be free of clutter. If you have someone to guide you on kitchen design, that’s great. If not, trust us, you can do it easily yourself. Indian cuisine involves many spices and condiments. Storing them in a way that they are organized but easily accessible is the real challenge. Nevertheless, it’s your kitchen. Customize the storage and build multiple foldable cabinets for minimum clutter. 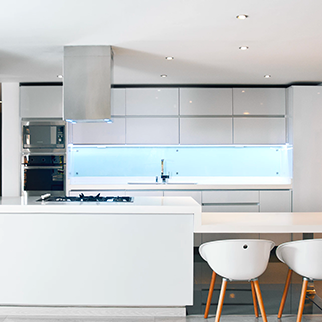 We hope we have successfully provided an outline to help design your kitchen in the best way. Whenever you design a kitchen, always remember its basic purpose. So whichever design elements you choose they m¬¬ust be based on this thought.